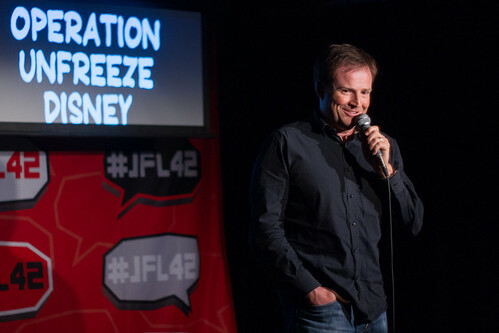 Set List creators Paul Provenza and Troy Conrad are in town to unleash their format on JFL42, which forces comics to abandon their material and do a fully-improvised set based on a batch of never-before-seen premises. As host, Provenza manages crowd expectations off the top, and encourages support. It’s needed: there are a few failures throughout, and while it’s tough to watch a good comic at a loss for words, we logically know there’s no shame in it. Some comics are better suited to the challenge than others. The rubbery brain of Sean Cullen is tough to beat. He didn’t just rise to the occasion with each of his individual prompts on Saturday night, but strung them together into a single bizarre narrative. He made it harder on himself, and succeeded. Jerrod Carmichael has been hitting home runs against the format too. His first prompt Saturday was “Overly Apologetic Fight Club”. Not everyone has as easy a time. Toronto’s Gilson Lubin made an obvious shift into prepared material, and owned up to it after a few moments. He all but gave up after that. It can be an unforgiving format, even if the audience does have empathy. Two more Set List shows happen at Comedy Bar Sunday and Monday nights at 11:00 p.m. If you don’t have a JFL42 pass, single tickets are $20 at the door, subject to availability.